Ever wish there was a member services initiative that could boost retention, contributions and product awareness in one fell swoop? Well, your wish is our command, so to speak. Money101 have pioneered an online financial education program that empowers superannuation fund members to improve their understanding of superannuation, as well as financial literacy in general. It’s a proven tool to drive member engagement and improve member retention. These days, super funds need to do more than the bare minimum to keep their members from switching funds. Value-adds provided as part of member engagement programs need to solve real problems that clients have, as well as being accessible, and scalable to each member’s needs. Money101 delivers on all fronts. By providing your members with access to Money101, you’re empowering them to address some of their areas of concern about their income and investments – as well as their super contributions. 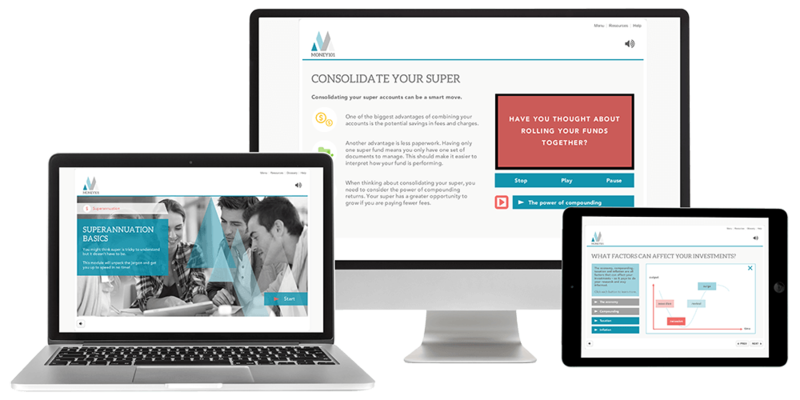 Speaking of super contributions, the messaging within Money101 modules is consistently designed to get learners thinking about the way superannuation fits in to their overall financial plan. The practical benefits of extra contributions, including tax efficacy, are regularly restated. We’re confident that, with implementation and uptake of Money101 amongst your members, you’ll see a notable uptake in contribution rates. It almost goes without saying: financial literacy and empowerment is at the heart of our mission. Amongst the Money101 team, there’s significant educational and instructional design expertise, shaped by years of experience in the financial sector. Because we are, above all, a digital financial education company, our programs get real results. With custom design options, you can offer branded assessment options to help measure results. Alternatively, we encourage clients to measure results through old-school survey methods. Our programs are education based, not product based. In other words, they’re about holistic learning on broader money matters that influence the member’s financial wellbeing. However, that doesn’t mean there aren’t plenty of opportunities to generate and offer product awareness. This can mean anything from mentioning a product category name in an interactive case study, to developing your own bespoke unit. We’ll happily collaborate with your marketing and product development teams to see how we can bring your member education vision to life. As a locally based team with a number of talented, fast working (and modest) multimedia designers on staff, we have the capacity to work to your branding guidelines. Whether it’s a simple change of colours, fonts and terminology, or a user experience that’s completely your own, we’ll make sure that Money101 fits seamlessly with your existing array of member offers. Every single unit you provide to your members offers an opportunity to reinforce key messages. Want to make sure they see super as the cornerstone of their investment strategy? No worries. Need to boost understanding of the value of insurance or professional advice? We’ve got you covered. Need a fully hosted solution? Money101 has the technical capacity to provide secure, reliable and schmick looking microsites, crafted to your design standards, to house your units and LMS (learning management system).